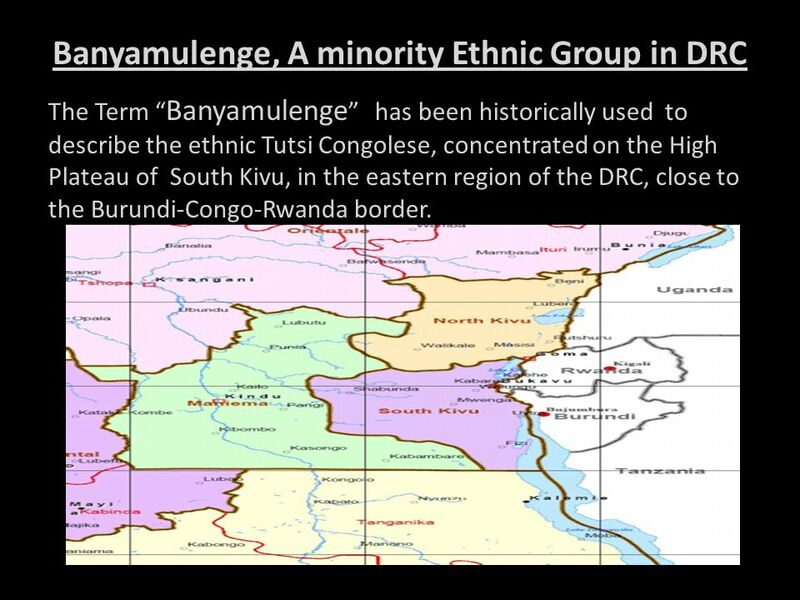 The Term “Banyamulenge” has been historically used to describe the ethnic Tutsi Congolese, concentrated on the High Plateau of South Kivu, in the eastern region of the DRC, close to the Burundi-Congo-Rwanda border. They are an ethnic minority from South Kivu, Their homeland is the highland triangle roughly bounded by the towns of Fizi, Uvira, and Mwenga (referred to as Hauts Plateaux as shown in the previous slide). Historically, the Banyamulenge have been a pastoralist and nomadic community, and form one of an estimated 400+ ethnic or linguistic groups currently living in DRC. They are sometimes referred t o as “Rwandophone” and it is believed by some historians that: That some ancestors of the Banyamulenge probably settled in the region in the 1880s. 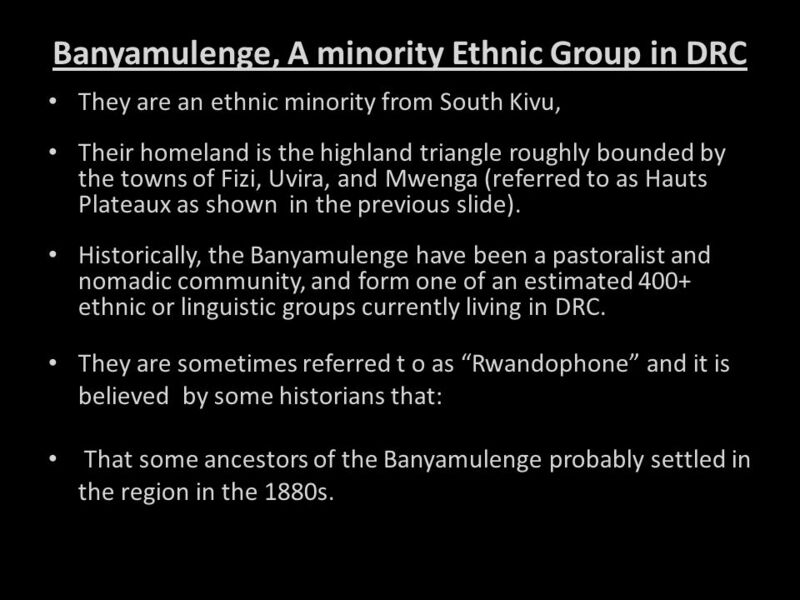 Banyamulenge speaks Kinyamulenge, which is a dialect of Kinyarwanda and Kirundi, the languages of Rwanda and Burundi respectively. Nevertheless, they have always been considered as foreigners in their own country. In the DRC, members of the Banyamulenge community and other communities of Rwandan origin are the only ones targeted for what they are (on ethnic grounds), regardless of their political allegiance. 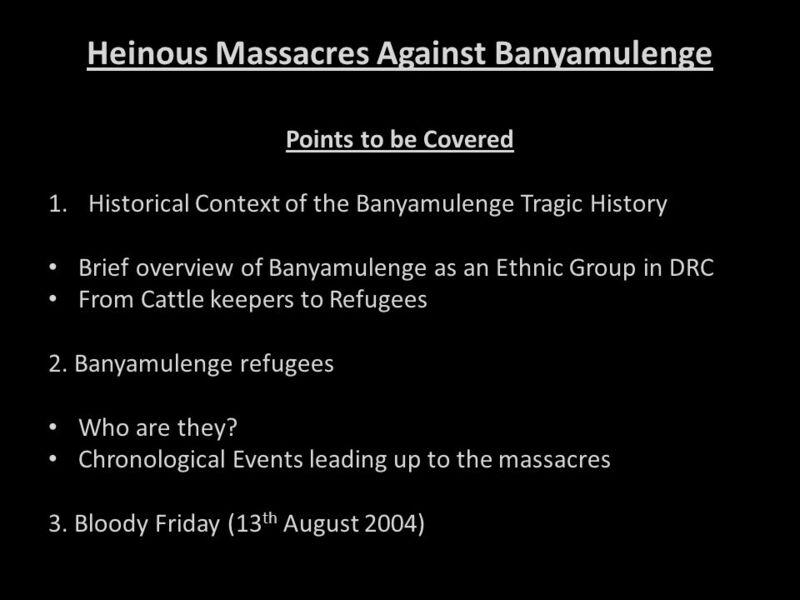 Since the colonial era, Banyamulenge have been undergoing discrimination and exclusion whereby they have been treated by the colonial rulers as immigrants from Rwanda who could not exercise any civic right in Congo. 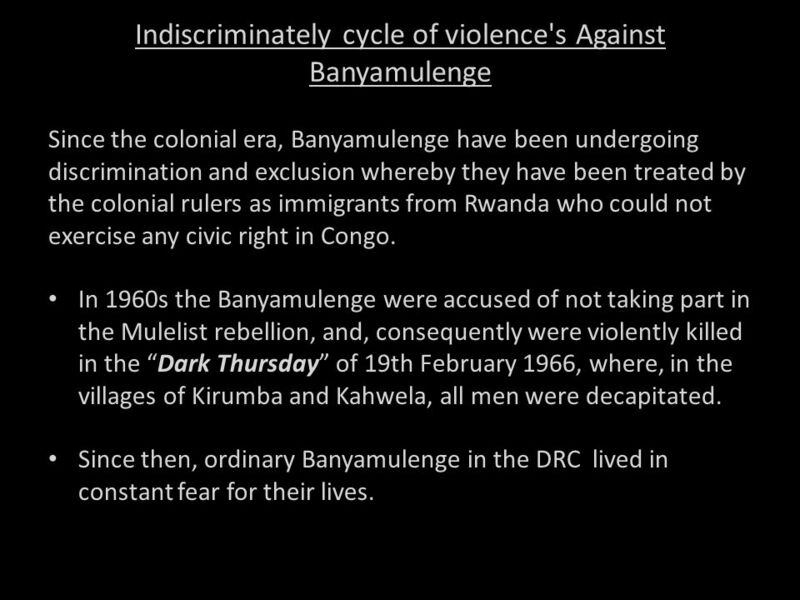 In 1960s the Banyamulenge were accused of not taking part in the Mulelist rebellion, and, consequently were violently killed in the “Dark Thursday” of 19th February 1966, where, in the villages of Kirumba and Kahwela, all men were decapitated. Since then, ordinary Banyamulenge in the DRC lived in constant fear for their lives. 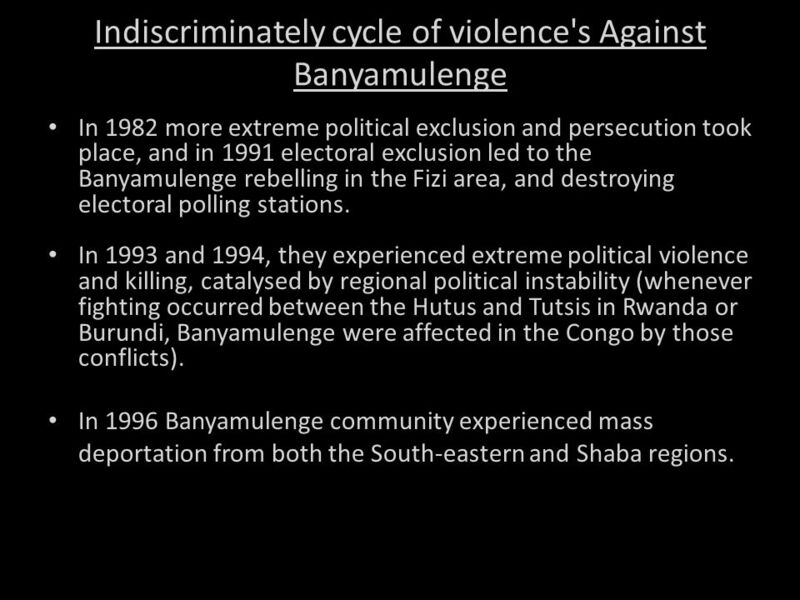 In 1982 more extreme political exclusion and persecution took place, and in 1991 electoral exclusion led to the Banyamulenge rebelling in the Fizi area, and destroying electoral polling stations. 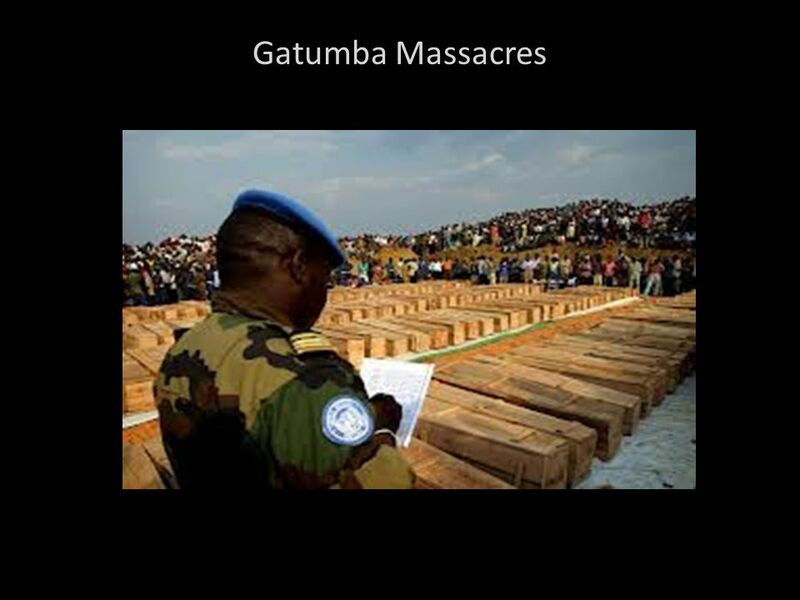 In 1993 and 1994, they experienced extreme political violence and killing, catalysed by regional political instability (whenever fighting occurred between the Hutus and Tutsis in Rwanda or Burundi, Banyamulenge were affected in the Congo by those conflicts). 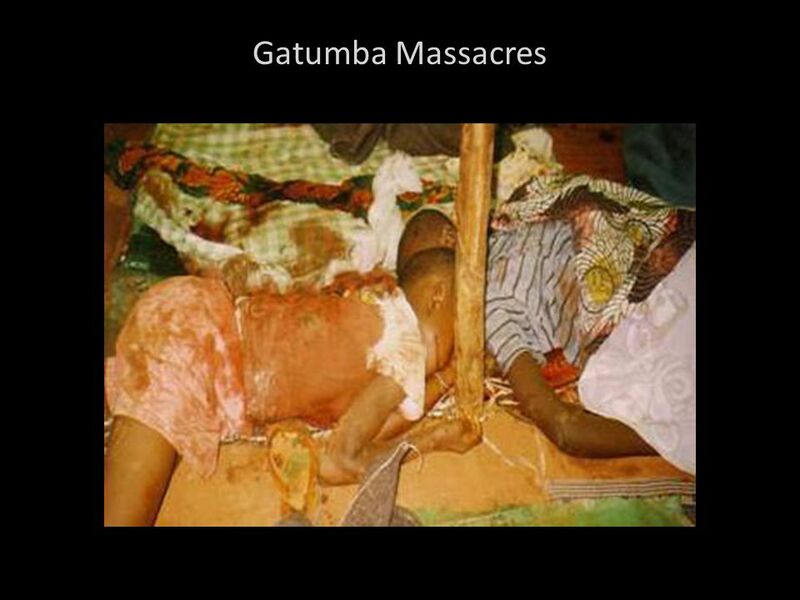 In 1996 Banyamulenge community experienced mass deportation from both the South-eastern and Shaba regions. 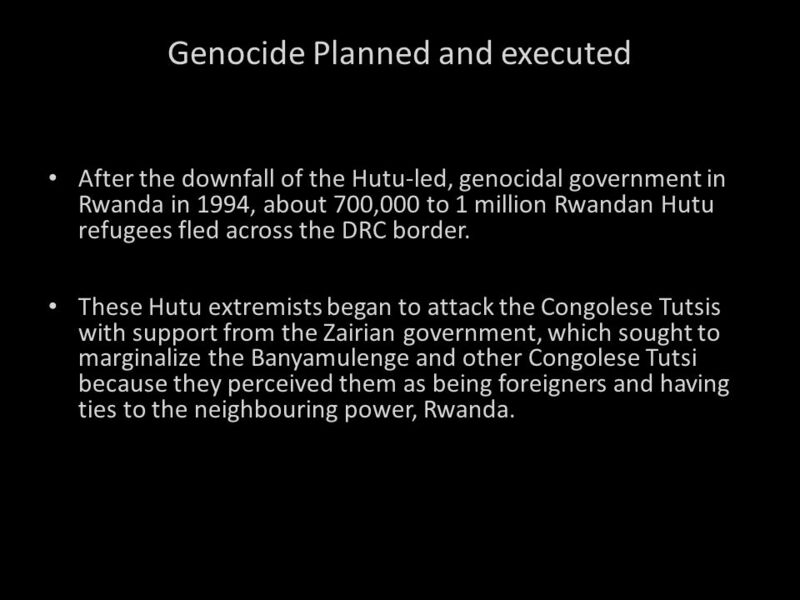 After the downfall of the Hutu-led, genocidal government in Rwanda in 1994, about 700,000 to 1 million Rwandan Hutu refugees fled across the DRC border. 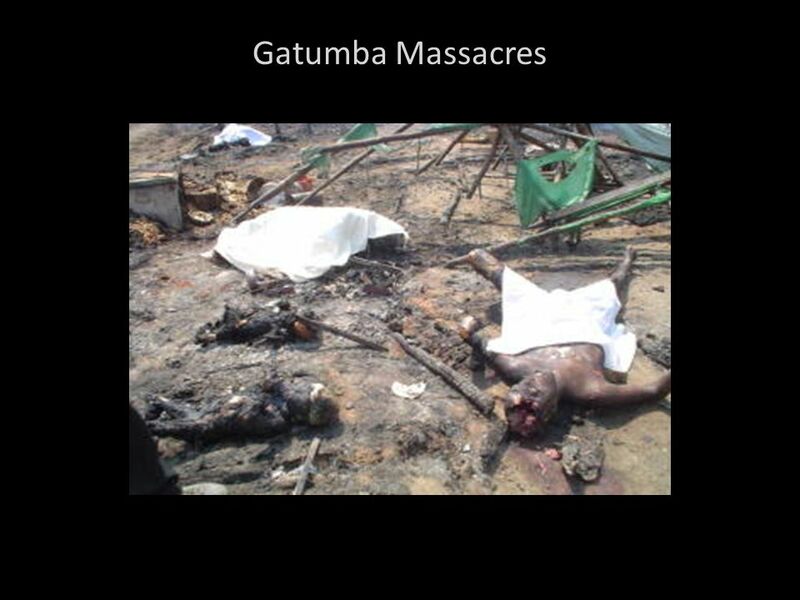 These Hutu extremists began to attack the Congolese Tutsis with support from the Zairian government, which sought to marginalize the Banyamulenge and other Congolese Tutsi because they perceived them as being foreigners and having ties to the neighbouring power, Rwanda. 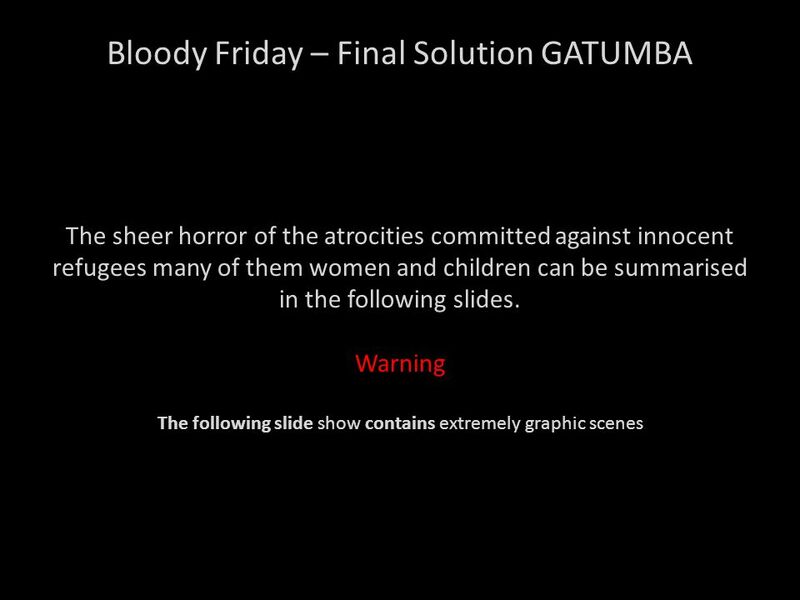 Gatumba Refugee camp tragic killings were implemented by the HUTU extremist group (FNL- under the leadership of Mr Habimana Pasteur and Agatho Rwasa There are also obvious evidences that the killing operations were conducted by FNL-PALIPEHUTU, FDLR composed by Interahamwe that committed genocide in Rwanda, and Mai-Mai under authority of Col. NAKABAKA, BALEKE, EKOFO, jointly with DRC’s soldiers chaired by General BUDJA MABE and Col. MUTUPEKE. 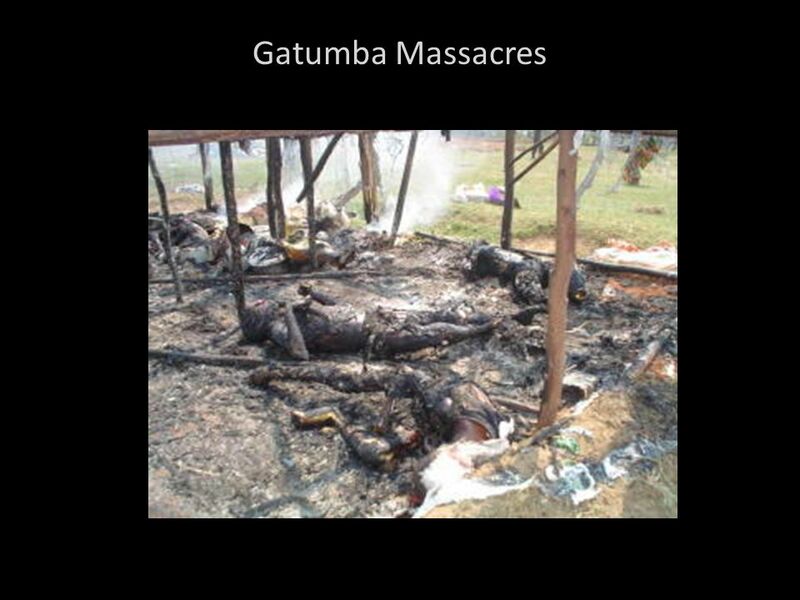 18 Justice must be served On this Tenth anniversary and remembrance of victims of the Gatumba massacre, we recognise that since the crime was committed, no active steps have been taken to bring perpetrators to justice. 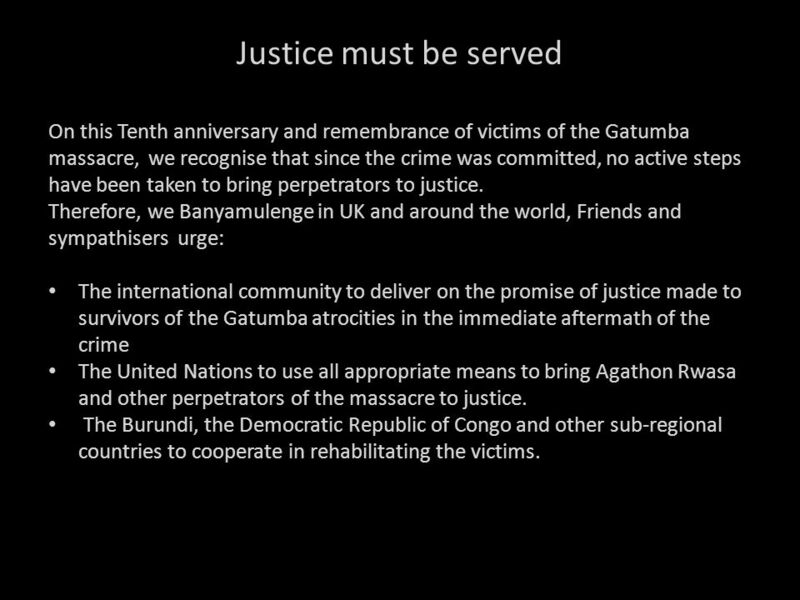 Therefore, we Banyamulenge in UK and around the world, Friends and sympathisers urge: The international community to deliver on the promise of justice made to survivors of the Gatumba atrocities in the immediate aftermath of the crime The United Nations to use all appropriate means to bring Agathon Rwasa and other perpetrators of the massacre to justice. The Burundi, the Democratic Republic of Congo and other sub-regional countries to cooperate in rehabilitating the victims. 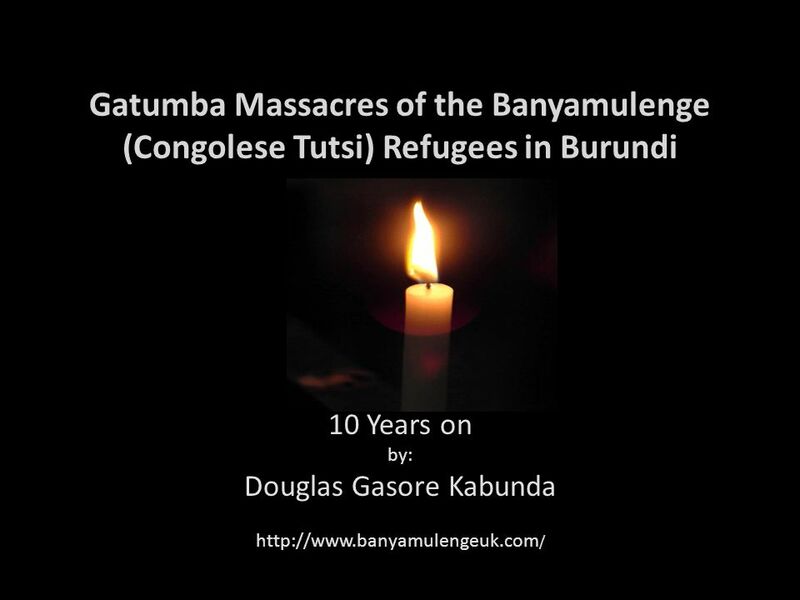 Download ppt "10 Years on by: Douglas Gasore Kabunda"
The Lake Countries Rwanda, Burundi. Objectives Label Rwanda and Burundi on a blank map of Africa. Identify the two main ethnic groups in these two countries. Rwanda Non West Background HUTUs Majority – 80% Migrated from southern Africa General: Found themselves as laborers and farmers TUTSIS Minority. Genocides are the methodical killing of a group of people based on their race, ethnicity, religion, or some other factor that separates one group of. 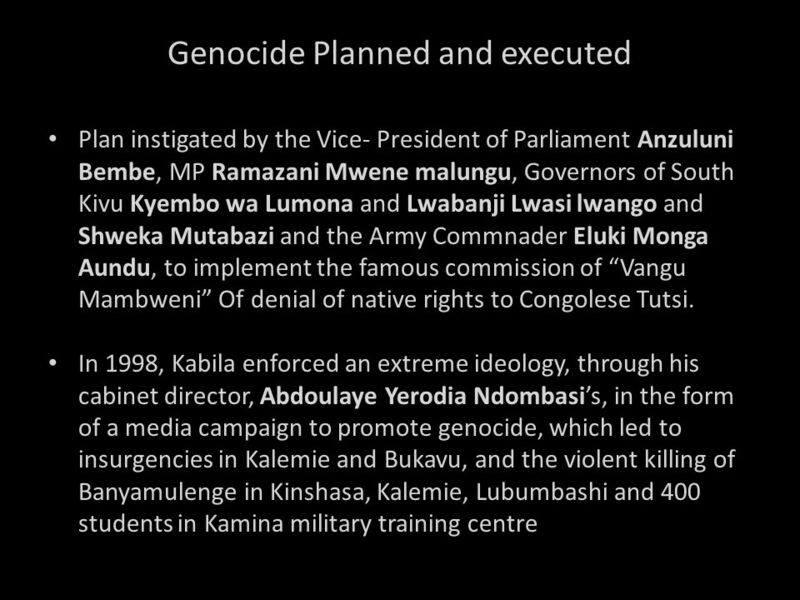 RWANDA GENOCIDE.  The problems of Africa should NOT concern Americans  The United States should take an active role in helping the people of Africa. GREAT WAR OF AFRICA Second Congo War. General Overview  Began in 1998, Declared over in 2003  Very unstable part of the world  Estimated 5,400,000. Conflicts in Africa. Democratic Republic of the Congo Formerly called Zaire ( ) 3 rd largest country in Africa (land size) Second Congo. ImperialismImperialism Leopold and the Division of Hutus and Tutsi’s  Hutu’s and Tutsi’s are the two major ethnic groups of the Congo  Belgians gave. Colonization of Africa Why do you suppose western nations colonized Africa in the 1800s? 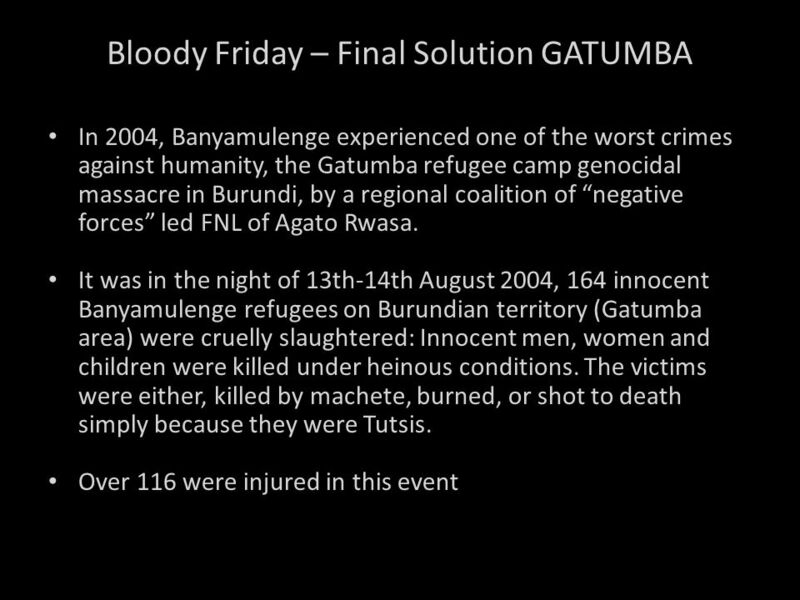 Rwanda Genocide. 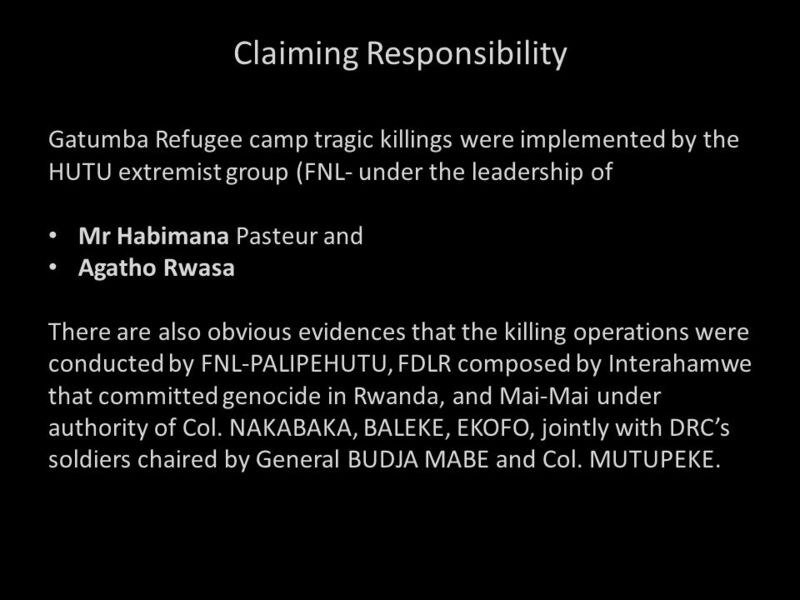 Perpetrators When: April 6, 1994 – July 15, 1994 Who: Hutu-led government and Hutu extremists Theoneste Bagosora (1941-present) Chief. Rwanda & Darfur. 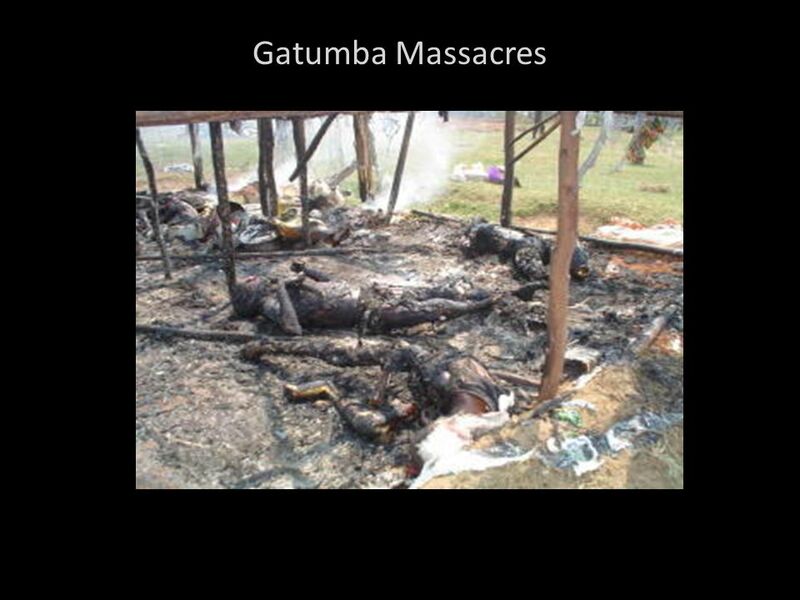  What might be some reasons why genocide has occurred in Africa? Modern Conflicts in Africa Rwandan Genocide, Crisis in Darfur, Joseph Kony. The Democratic Republic of the Congo. Paul Farmer: Humanitarian Dr. in Haiti. Elimination of New Pediatric HIV Infection & Prevention and Response to Survivors of Domestic and Gender Based Violence in Rwanda Revised PowerPoint.